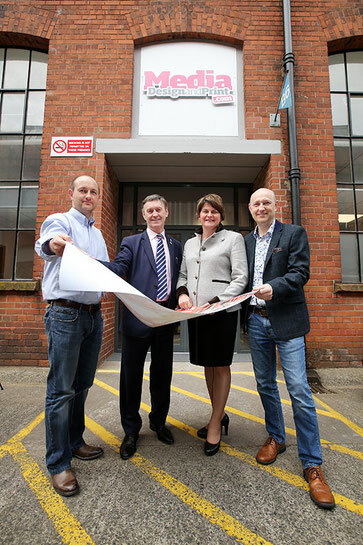 First Minister, Arlene Foster MLA, officially opens Media Marketing / Media Design and Print's newly extended premises. Also pictured (L-R) Michael Beckinsale, Harry Beckinsale and Harold Beckinsale. Media Marketing opened its doors in 1985 to offer a unique service to local trade groups and good causes via the production of bespoke publications, tailored specifically to their needs. The brainchild of Harry Beckinsale and his late business partner Ivan Thompson, progress was swift. Organisations were hungry for publicity without the usual high overheads, and it became clear at a very early stage that the service being offered was one not to be overlooked. With a forward thinking policy firmly in place, Media Marketing evolved significantly in the years following its formation, striking up sound relationships with leading charities, such as Cancer Fund for Children, Macmillan and Marie Curie as well as local special needs schools, such as Fleming Fulton and Tor Bank. After the untimely passing of Ivan Thompson in 2007, Harry's two sons, Harold and Michael, joined him in continuing their unique service. Further developments have seen the formation of Media Design and Print, now one of Northern Ireland's leading digital print companies. Another recent development has been their very popular sticky label website Loadzalabels.com, regularly taking orders from across the UK and beyond. Consideration of the needs of local good causes is always paramount, with a standard discount available to charities and good causes on all print orders. A personal vested interest is always at the heart of what we do. Sponsoring activities and helping where we can is something that we're proud of and look forward to continuing with as me move forward.